Select the Material you want to apply the shader to. 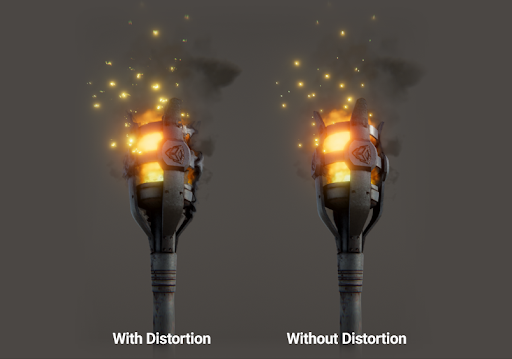 For example, you could apply a Flame Material to a Fire Particle System effect. See in Glossary, select Shader Particles. Choose the Particle Shader that you want to use, such as Standard Surface. 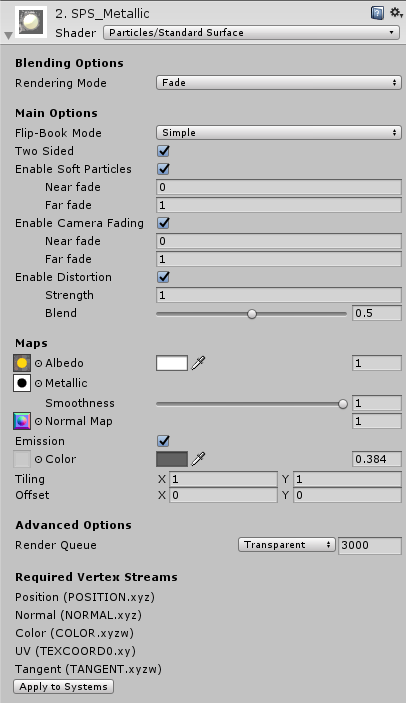 Enable and disable the various Particle Shader properties in the Inspector. See in Glossary (or a subset of those properties, depending on the Shader). This page describes the properties and options that are additional to the Standard Shader properties. For information on the Standard Shader properties, see documentation on Material parameters. All of the Standard Particle Shaders have Blending Options that enable you to blend particles with the objects surrounding them in different ways. Additive: Adds the background and final particle color together. This is useful for glow effects, like those you might use for fire or magic spells. Subtractive: Subtracts the final particle color from the background, which darkens the particles against the background. This is useful for foggy effects, like those you might use for steam, or thick black smoke. Modulate: Multiplies the final particle color with the background color. This is useful for portals and light-rays. Multiply: Multiplies the particle albedo color with the particle texture. Additive: Preserves a hot spot, such as a white part of the particle texture, while adding the particle albedo color to the darker pixels of the texture. 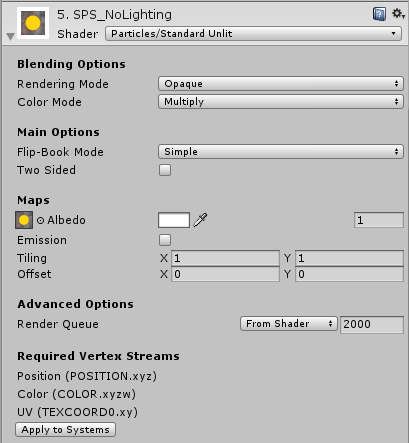 Subtractive: Subtracts the particle albedo color from the particle texture. Overlay: Gives more contrast to the original color and adds the particle albedo color to the gray values. This is similar to Additive, but preserves the original colors. Color: Uses the alpha channel from the particle texture and the albedo color from the particle itself. This is useful for overwriting particles with the same color, while keeping their original “shape”. Difference: Subtracts the particle albedo color from the texture, or the texture from the color, to get a positive value. This is useful for a range of effects where you want a more dynamic color change. See image below table for a demonstration of this effect. Simple - Render frames in a flip-book as a sequence of individual frames. Blended - Blend the frames in a flip-book to render the flip-book as a smooth animation. Near fade - The closest distance particles can get to the camera before they fade from the camera’s view. Far fade - The farthest distance particles can get away from the camera before they fade from the camera’s view. This effect can be quite expensive because it captures the current frame to a texture. See in Glossary. 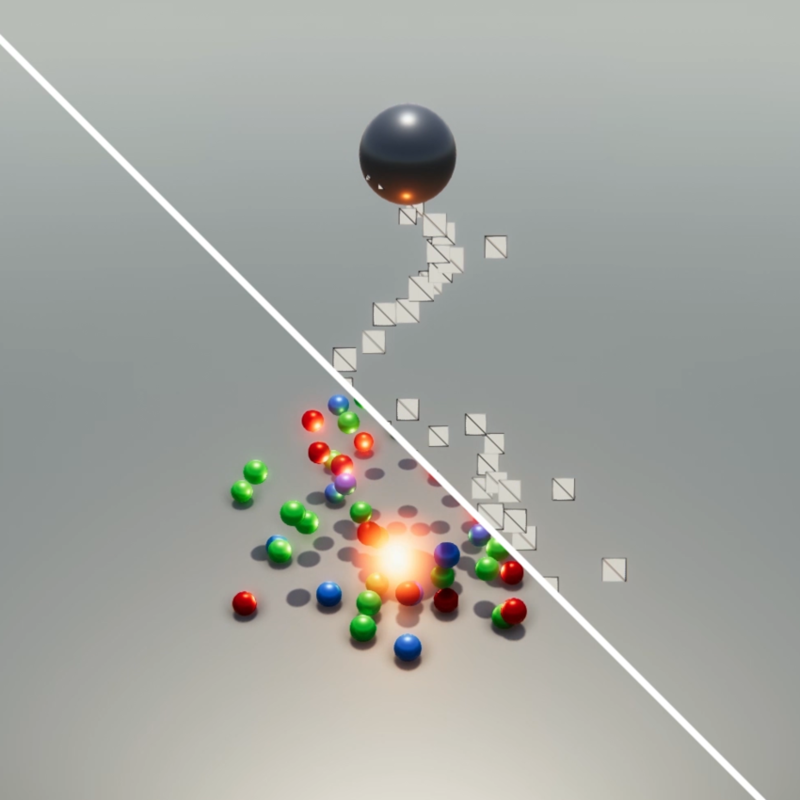 It does not include features that are unsuitable for dynamic particles, such as lightmapping. See in Glossary. It supports all of the generic particle controls, such as flipbook blending and distortion, but does not perform any lighting calculations.